The NECA-IBEW Pension Trust Fund (Pension Trust Fund) was established on June 1, 1971 and became effective on March 14, 1972. A plan year begins on June 1 and ends on May 31 each year. The Plan Year is the period on which the Plan keeps its annual records. There were originally two locals in the Plan: Local #538, Danville, IL, and Local #725, Terre Haute, IN. Danville’s original contribution rate was twenty cents and Terre Haute’s was ten cents. Many of the other locals came into the Plan in the following three years. 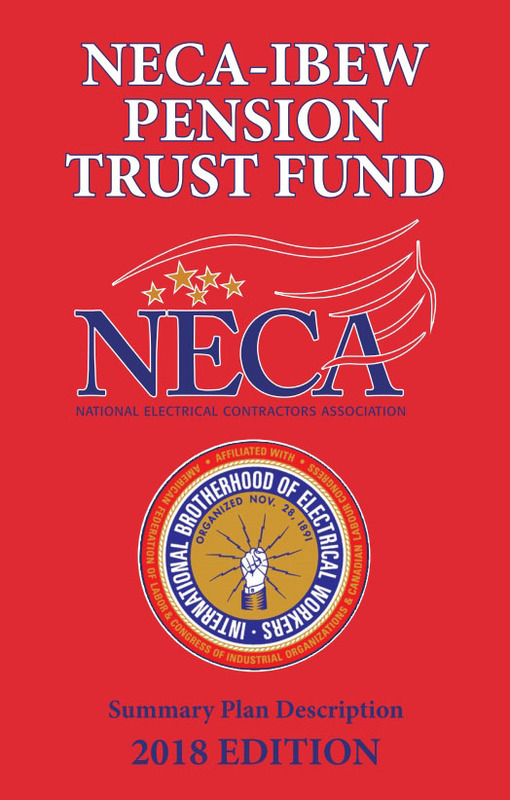 There are currently thirteen locals in four different states that are being administered by the NECA-IBEW Pension Trust Fund. The benefits of the Plan are financed by contributions that Employers pay into the Pension Trust Fund. The contributions can be based on a rate per hour for all hours worked or on a percentage of gross wages. Employers pay the entire cost of the plan; the plan does not allow participants to make voluntary contributions. There are currently almost 3,000 pensioners that receive monthly checks. These monthly checks range from just a few dollars to more than $5000.00. The Plan is a multiemployer defined benefit plan. The Plan provides you with a benefit at retirement determined by the Plan formula. Every year a certified actuary performs a validation of our Plan to verify that the contributions received are sufficient to meet the minimum funding standards established by law. Your trustees have the responsibility and discretion to invest all Plan assets. For your convenience, an Interactive Benefit Application form can be completed online. This form can then be printed and returned to NECA-IBEW by fax or postal mail. Please do not email the Benefit Application as it contains private information and email may not be HIPAA-compliant. The Pension Plan can be a major factor in building your future financial security and you are urged to familiarize yourself thoroughly with the details highlighted in the Pension Trust Fund Summary Plan Description 2018 (SPD). Every effort has been made to avoid any conflict between the text of the Pension Trust Fund SPD and the text of the Plan Document, but in case a conflict does exist, the text of the Plan Document will govern. Please go to the Documents and Forms page, and select the category Pension Summary Material Modifications for more information.